As a child without television, phone, or any electronic distractions, in complete freedom during the long summer days when my parents were at work, I asked questions of wild life. I lay on the ground eye-to-eye with fighting beetles and clashing pairs of praying mantis. I knew where the black widow spiders, the horned toads, and the crawdads all lived. I brought fearsome red fire ants home in a jar of sand to watch them replicate their home tunnels, to gape at their amazing labor of moving and hauling, building and cooperating. I watched them clean out their house and carry their dead above ground. I also knew how dangerous they could be; a toddler had to be hospitalized after getting trapped on one of their big sprawling mounds in a lot near our home. I had dropped my Levis to the ground more than once, shrieking with the pain of a red ant stinging my knee. But living close to them as they were safely encased in the glass jar, I was learning to love them, as well. Asking questions is how I came to closely watch Mollie, the wild cat in our neighborhood, in her hunt for the grasshoppers and mice that fed her. I saw how she swallowed a mouse until only the tail dripped down her chin and then allowed it to slowly slither into her slender inexorable maw. My nine-year-old self laughed until my sides hurt over this sight of the tail dripping out of her mouth. As I trailed around behind wild Mollie, wanting to know her habits, I also wanted her to reach out to me. She never did this, though she did give presents to a neighbor dog. A medium-sized young collie had been tied to a wire clothesline by neighbors who owned him. He could run up and down the yard, his leash sliding along the line as he barked angrily at everything that came into his view. Not much did, on those long hot nearly silent days. The first indication I had that animals reason and have compassion came from watching how the little grey cat lurked around the building near the collie’s confinement, with a dead mouse in her mouth. She would wait until the dog was at the other end of the big yard, and then would trot over to drop one of her extra catches under the clothesline so the dog could reach it. While I thought this might have been coincidence the first time, I saw Mollie do this several times, and saw also that the dog found each little body and joyfully played with it for the better part of his otherwise monotonous days. The little wild cat had reached across to the dog, with every appearance of empathy and decision-making. Perhaps this was the germinal moment of my desire to experience creatures reaching across species lines, and of longing for them to communicate with me, not pet to owner, but creature to creature. I wanted to know them, and didn’t know how to initiate the dialogue. Would any of them reach across to me? Could I learn to reach across to them? As I entered college and in 1961 attended a year of medical laboratory school and then college again, my educational experiences sharply distanced me from creatures, as well as from the human body. Medical language was constructed in 17th-century Latin-based syllables expressly to achieve this distancing, to ensure the emotional stillness necessary to cut someone open and work on fixing their internal organs. “Cardiac” is so different (in meaning) from “heart.” However, the specialized distancing necessary for science and its preoccupations then became part of a broad Western philosophy about the nature of reality, and of nonhuman beings. Nature was mechanistic, this view said, and fishermen echoed: “fish don’t have feelings.” Creatures don’t think, this view insisted; they operate solely on “instinct,” imagined as a set of pre-existing internal settings that somehow came about through evolution without intention or volition, without interaction and culture. Despite all this, my path kept returning to the open curiosity and affection of my childhood. I conquered an irrational terror of wasps by giving them water, and learning to remove them from my house with a piece of paper and an empty glass. And I continue to cherish those life moments when I can still my incessant human activity enough to just be with another species long enough to learn something. The cleverness of their communication system came clear when with a friend in India, I watched a group of ants—a medium-sized light red variety. Their task was to insert the body of a long, slender-winged beetle into a crack about three feet up a wall. The group had posted four overseers that formed a square on the wall about six inches above and below the crack site. A work crew held the body, twisting it this way and that, getting the front part way in, then backing out, rearranging from radically different positions, trying again. The beetle was longer than the crack opening so this operation didn’t look possible to our eyes, yet to theirs it obviously did, as they spent twenty minutes on the maneuvering. The oversight crew appeared to signal with their antennae between each attempt, as though conveying logistical information, and eventually the crew succeeded, vanishing with their prize into the wall opening, followed by the four members of the talkative oversight crew. People who study ants closely say they communicate through smell, sending out pheromones from glands in their bodies, detected through their antennae. But what of the ant-movers on the wall? Did their out-posted lookouts have pheromones that could tell the work group, “Try again from a steeper angle girls, and turn the body on the bias.” What would be the signal language for, “Try 90-degree angle, try from the left, try turning the body upright, a certain portion out from the wall”? However they do it, the instructions eventually enabled the ultra-strong worker ants to hold the long body of the beetle in defiance of gravity, then slide it like a letter into the envelope slot in the wall. Insects talk to each other, but do they also attempt to talk to us? One day, I looked down at my arm to find a small brown ant vigorously touching its antennae to the fine hairs on the back of my wrist. I watched this one-sided interaction for a long time—minutes of my time, hours of ant time—and had a strong impression of witnessing someone trying to engage a conversation. Was this ant attempting to detect intelligent life on planet human? Having no way to consciously manipulate my arm hairs, I could not respond in any way, watching helplessly until the patient creature finally gave up. I can only wonder, and hope some clever naturalist devises antennae-like linguistic devices through which we can connect to these marvelous beings. One day in 1995 my childhood desire to have a personal interaction with an insect—this time a dragonfly—was fulfilled. 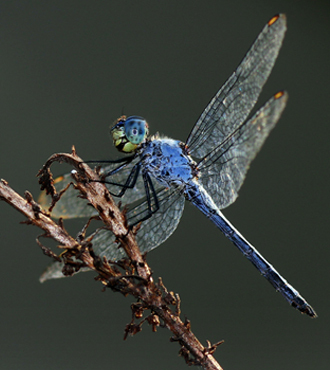 An encounter with a dragonfly is an encounter with a gatekeeper of spirit, according to the lore of some indigenous people of the North American continent. The connection, usually initiated by the creature, indicates a major change in one’s consciousness and therefore one’s life. 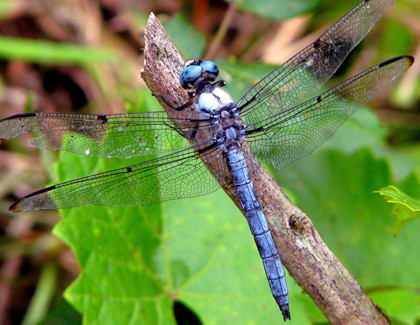 My very personal dragonfly encounter took place summer of 1995, and lasted over an hour. Kris and I were playing golf with our friend Ruth, on the Willow Park course in Castro Valley. Ruth’s ball had gone into the creek that runs the length of the course and keeps it both challenging and life-filled. From TV images, golf courses seem like human-only territory, but the municipal courses my friends and I play in the Bay Area are full of wild creatures. A blue heron lives along Willow Creek, as do hawks and snakes, rabbits and foxes, turkeys and coyotes; once, we saw a mountain lion on a nearby hill. So when I went over to help Ruth look for her ball I wasn’t surprised to see something moving in the thick scum of algae growth covering the water at this particular spot. An insect about three inches long was persistently, if weakly, moving. I called Ruth to come with her long aluminum ball retriever, and she got the cup of it under what we now recognized as a dragonfly. The rescue immediately looked like a cruel exercise in futility as we saw that the body of the creature was completely enmeshed in webs of slime, a mossy growth of algae in long thin intersecting lines that made a netlike cocoon around the struggling body. The largest dragonfly I had ever seen now lay helpless in the palm of my hand. Gingerly, I began to strip off the binding strands of slime. There were dozens of them. Would the dragonfly let me help? My fingers looked huge compared to the vulnerable, exhausted body in my hand. We still had a golf game to play, and golf etiquette requires keeping up the pace, so we treated the creature as we walked along, at first taking turns holding it while we hit our shots. The creek area where we had found the dragonfly was the fourth hole, less than half way through our game, which is about a mile and a half in length. By the fifth hole she—I call her she because she was so large, and often among flying creatures the larger ones are female—was riding on Kris’ shoulder, clinging with well-developed hooked ankles and feet to the cotton cloth of her tee shirt. Because my fingers are small I was best qualified to softly, softly unfurl the stubborn shroud of muck from the fragile body. Holding my breath I peeled layer after layer until I could see the structures of form, a long brown body, large dark eyes, two pairs of magnificent, delicately netted wings, now crumpled and stiff. After I had stripped away most of the filaments binding her legs and the first of several layers of fiber from her wings, the still-encumbered creature made an attempt to fly. The flight consisted of a yard long head-over-heels somersault to the ground, testifying to the fact that the second layer of muck, which had dried by now on the wings, was weighting them down and had caused their usually transparent fabric to crinkle into what amounted to an aerodynamic crisis. The dragonfly raised not the slightest protest when Kris picked up her upside down body and placed her again on her own broadly human left shoulder. I went back to my restoration work, aware that drastic measures were indicated for the crinkled, disabled wings. I pulled another layer or two from the body, and tenderly worked a few more strands from under the wings, of which she had two pairs. The coating on top of the usually transparent wings had now completely dried and looked to be a permanent cement, rippling their thin surfaces like bent airplane propellers. I set aside my fears that I would tear the fragile, brilliant instruments of flight and remembered the bottle of water always tucked into the pocket of my golf bag, along with extra balls, an old glove and a bag of raisins that had petrified in the heat. In a hurry, I raised the water bottle over the wing, aware of watchful dragonfly eyes, The sight of the bottle’s metal form looming overhead immediately set off a creature alarm and her second attempt to fly. Again, flight was a breath-taking failure as the dragonfly catapulted head-over-transom onto the dry California earth. Again, Kris leaned down and picked her up, and again, the shoulder was solace and hope, as hooked feet dug in. 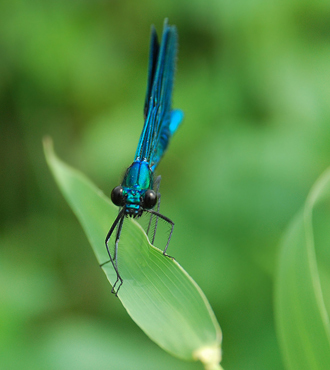 Now I became cognizant of a strong current of awareness beaming toward my eyes, and emanating from what looked like a little square organ on the dragonfly’s head. I became certain that she was in touch with me, was thinking, and not only thinking, contacting me somehow with her thinking. Smarter now and more patient, I wet my fingers first then slid them ever so lightly over the wings, first the two on the left, the most encrusted. The water dissolved the stiffened filaments, and allowed me to roll them. Now she was far from being in a state of panic; the dragonfly was acting as though she knew exactly what I was doing to help, as I could tell from her body language. She seemed to be making very conscious motions, turning and lifting her wings one by one, separating the upper and lower pairs so as to allow the needed access for my wet fingers, and enhancing the process of my tender work. Could this be true? Giving up the golf game, I stayed completely in the moment as I rolled and rolled until the slime fell off each wing, which as it did, immediately straightened. Elation! And our conscious connection was not my imagination— the dragonfly was turning to engage my wet fingers, was guiding me into the next step and the next, turning to present her other side, and the undersides as well as the tops of each of her four wings, and also her wire-like legs. We were working together! Delicacy of timing in joint effort did not fail us, and by the end of the sixth hole, the slime was off. One wing remained a little wrinkled, but the game of recovery was won, and this was clear to all of us. We relaxed. She would live. With her long body as brown as the recently released mud, the dragonfly stayed still on Kris’ shoulder. “Resting,” I heard clearly as I stared at the head box between her large eyes, that appeared to emanate toward my mind, and now emitted a golden glow that opened my heart as well, a distinctive sensation that I experienced physically, as well as emotionally. The insect foot-clutch on cotton cloth was confident, even as Kris hit her shots off the tee and fairway. When the golfer’s left shoulder dipped, the dragonfly dipped with it, as though on a slender bough in the wind. On the seventh hole, I noticed the change. It began as an underglow in various sections of her body, so at first I wondered if it had been there all along and I simply hadn’t noticed. Then the blue color became more evident, then startling, deep and luminous as summer sky. “Look,” I said breathlessly to my companions, “She’s a blue dragonfly.” The blue was that sparkling clean lake-water shade beloved of race car drivers and motorcyclists, and it spread until the whole body had it, except for the dark eyes and the darker box, that intriguing communicating shape that I could feel as well as see between her eyes, on top of her head. Then, amidst the blue, dazzling gold appeared as well, as though a whimsical, good-humored and patient painter had put golden trim on a particularly treasured model. We were all in love by then. Ruth and I continued to exclaim our pleasure, and Kris glowed as she craned her neck to check on the condition of the creature that rode her like the most stable of horses across this winding course. Each hole on a golf course takes about fifteen minutes to play, so we had been with her for almost an hour. As we left the seventh hole, the dragonfly turned her body around into the late afternoon wind and we sensed another change. “She’s getting ready to leave,” Kris predicted. I tried to keep my attention riveted so I wouldn’t miss the take-off, but as we walked up onto the eighth tee box, my eyes wandered and I didn’t see till Kris called out. The blue dragonfly had launched and was already high above Ruth. Stopping still about thirty feet in the air, she performed a steep downward spiral dance, directly over Ruth’s head, before twirling left and disappearing into the upper branches of the nearest tree. My rational mind, always clicking away in its sometimes cynical fashion, said into my ear: “Probably a practice spiral, not necessarily a dance of gratitude and fare- thee-well.” But none of us believed that, especially because we were left in a happy state that lasted days afterwards, as happens from a visit with persons one loves intensely. Rational mind is frequently wrong about these fine interactional moments, so I was surprised but not skeptical at our next encounter, which took place about a month later. That much time had passed before the three of us again played golf on the Willow Park course. As we approached the fourth hole we were recalling that this was the place where we found the creature that had spent such a long time in our care. Deliberately, I had worn the same hat and shirt I had on then, and my companions had on similar clothing. The air directly above the tee box was swarming with dragonflies as we arrived, at least fifty of them, most of their bodies in the brown state, though a few of the larger ones were blue. Had they been gathering there for days? Were they gathered there on this day because of some food source or because every year at that time they gathered there? Or, as our lifting hearts told us, were they gathered there because we had been recognized and they wanted to perform a group acknowledgement? A dance for us. One, a particularly large blue one, came very near and looked into my face—and I could sense a connection. Once again, I felt the heart emanation from the head area, straight toward my own opening heart. According to anatomical drawings, a dragonfly has an organ called an “occipital triangle” just in back of, or between, the large compound eyes; perhaps this was the source of the emanations I felt. 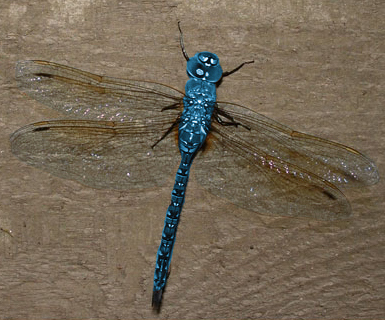 A year following our first encounter with the blue dragonfly, we played again on the same golf course. I wore the same tan golf hat. And once again, at the fourth hole, a dragonfly approached me. She was brown-bodied, large like the one we had rescued, and she hung in the air about five feet in front of me, looking directly at my face. She flew higher and did a little downward spiral dance, twice. The encounter took only about a quarter of a minute but was very intense. After she left, I felt a burning sensation in the lower left quadrant of my face, spreading to my heart, flooding me with goodwill. I have come to recognize this from my travels in India as a shaktipat, a sensual experience of eros, heart-opening spiritual love with extreme joy given as a darshan, a blessing. It is both physical and emotional, and I am unable to conjure it from my imagination, or from inside myself, alone. The sensation of intense heart-open love following my encounter with the dancing dragonfly lasted about five minutes before fading. Fortunate encounters with insects, moments of wonder, of rescue and recognition, of communication and camaraderie, of intense love and long memory, remind me that we are not alone here on earth, abandoned on a burning stone whirling mutely in space. We are connected in relationships of diversity, human with human, human with insects and plants, creatures and spirits, requiring only that we pay attention and stay still enough to think/feel the connection, and accept that we have been recognized, sent a vital communication, given a gift. Judy Grahn: is a poet, writer, and purveyor of embodied philosophy (Metaformic Consciousness). Her work has been part of a number of social movements, which have enabled certain changes, so she is an optimist. 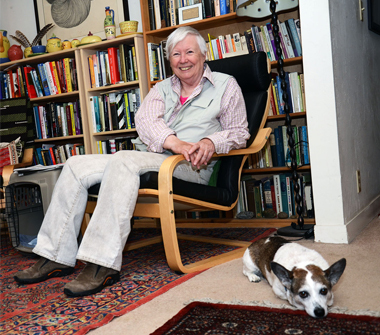 She recently finished, and Aunt Lute Press published, a memoir of the first half of her life, A Simple Revolution: the Making of an Activist Poet. The book tells stories about her childhood and people who lived through various social justice movements with her, some of whom she interviewed and quoted. For her next collection, she wants to tell a very different set of stories, about times in her life that spirit, or one of the variety of minds within nature, has reached out and said “hello,” or “help” or “stop” or has redirected her. And also, times the reach-across has failed. “Dragonfly Dances” is part of that exploration. Want to comment on any Issue of Dark Matter, fill out the form here. Copyright © 2014-2019 Dark Matter: Women Witnessing - All rights reserved to individual authors and artists.